Round of 32 action in Europa League will finish today with a number of contests, including Arsenal taking on Ostersund. There is not much danger for Arsenal at this point, as they are currently leading 3-0 in aggregate heading back to the friendly confines of their own stadium. In short, Ostersund will need something akin to a miracle to make this competitive, as they will not only need to overcome a deficit, but they will need to score at least 3 road goals as well. The odds to qualify are almost too ridiculous to post, as Arsenal is currently listed at 1/1000 at the books that are still offering a line on the qualification odds. 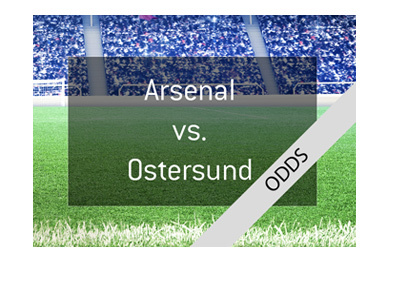 Most sports books have Ostersund at over 100/1 to advance, though their odds should probably be closer to 1,000,000/1. Arsenal has struggled in English Premier League play so far this season, as they are currently sitting in 6th place in the table. They are a full 7 points behind Tottenham for fifth place and 9 points behind Liverpool in third, which means that Arsenal will likely need to win Europa League in order to qualify for Champions League next season. This is easier said than done, as there are a number of good teams that are still alive in Europa League, including Borussia Dortmund, Atletico Madrid and more. Ostersund, on the other hand, plays in Allsvenskan, which gets underway later this season.